I was asked if I would like to participate in a blog tour for How to Be an American Housewife and although these days I tend to shy away from book tours, this one had a few things going for it that attracted me to it. It tells the story of Shoko, a young girl in Japan, who married an American GI post-World War II and moved to America. Written by Margaret Dilloway, she formed the idea for this story by listening to her own mother's life story. 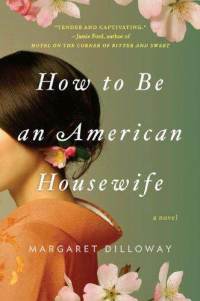 Dilloway's mother was also born and raised in Japan and used to tell her daughter stories of life in her home country. She, too, married an American GI and moved to America after the war. A few pertinent details of Dilloway's mother's story provides the basis for this work of fiction. Most of this book was birthed in the imagination of Dilloway. The story is broken up into two parts. The first half of the book is told from the perspective of Shoko, who is reciting from memory various facts of her life in Japan. To avoid spoilers, I'll simply say that her move to America with her new American husband caused a rift between her and her Japanese brother, Taro. The second half of the book is told from the perspective of Shoko's daughter Sue, who returns to Japan on behalf of her mother, hoping to repair the damage done to family relationships. On the one hand, this is a story of the effects of war and society. On the other hand, this is a story of a mother-daughter adult relationship. I liked it - with exceptions - on the whole. I do have some cautions to give in relation to it. I'm a more conservative reader, as my regulars well know, and am infinitely suspicious that I will discover language and/or inappropriate love scenes in the modern novel. Modern novelists haven't seemed to clue into the fact that if they curse incessantly in their stories, they are dating them to a degree and I anticipate their works falling by the wayside in the long term. If I think a book isn't going to stand the test of time, I wonder if I should spend anytime on it whatsoever in the now. I suspect a great many books that have been published in the last decade will fade away into oblivion (at least, I hope so!) because you won't be able to distinguish them from each other and because they were written for the present day audience in all their stupefying formulaic plot line glory. When it comes to How to Be an American Housewife , I rather suspect it falls into the same category as those I vaguely allude to above. I do think that this book has some historical significance going for it. It explores a little known slice of history through fiction: what did happen to the Japanese culture post-Nagasaki? Many Japanese women did marry American GI's, moved to America, and had to deal with racial prejudices and suspicions from their now fellow Americans. It's something we don't think about as much today as you see interracial marriages occur with a great deal more frequency and it's accepted a great deal more now than it was immediately after World War II. "Are you a Christian?" He ate an unidentifiable piece of fish. It smelled like caramelized soy sauce. I paused, trying to think of how to explain what I was. I remembered the prayer I had made earlier. "I'm nothing, I guess." I believe that is most true. No one is nothing. No one is neutral. Everyone has a worldview, whether they can spell it out to others or not. Everyone believes something which then dictates their words, their thoughts, their actions. Then they must also deal with the effects of their belief system, again whether they acknowledge that they have one or not. No one can "be nothing." It is an impossibility. There were no love "scenes" in this book - just allusions to them. So if you have an aversion to just that aspect in novels, I think you are safe here. Sometimes you know what's happening, but it's not spelled out for you - which I did appreciate. In fact, once I had to re-read a paragraph to see if I was assuming correctly because I wasn't sure at first. I'm glad Dilloway didn't feel the need to divulge that much information because that'll effectively kill my desire to read a book right then and there. As I said though, there is language and a dabbling in various religions and cultural issues which make me have to offer cautions - as well as admit that this is not really a book I feel I can recommend. I would be very choosy about who I offered this book to, personally speaking. There's enough in it that I can't recommend it carte blanche, but enough about it of merit that made me feel like sharing my opinion on it. (As my regulars also know, if I hate a book, I typically will simply not review it at all.) I don't hate this one. But I don't exactly love it. I eye it with suspicion while finding it an intriguing idea for a piece of fiction. If Dilloway had just stuck with the family relationship between Shocko and her Japanese family, removed the language and a few references to modern cultural issues, I would have been released to like it a bit more than I did. But, as does seem to be the trend, authors these days like to throw in things for . . . what reason? I mean, really. Just tell me the story. That should be enough. Thanks, Penguin, for sending a copy of this book in exchange for my honest opinion and for inviting me along on this book blog tour. Thanks for the thought-provoking review. I loved this book when I read it last year, especially Shoko's story and her relationship with her daughter. I found her daughter's quest to find herself interesting as well but to a lesser degree. I've linked to your review on War Through the Generations. This is not the first review I've seen...the idea intrigued me, but, like you, I am cautious with what I read when it comes to modern books for the same reasons. Thanks for sharing about it. Is the language here and there or somewhat consistent throughout? This sounds like it could have been really interesting if the author had handled things a little differently. This book sounds quite good. I actually wish that you would "screen" more mainstream books for us! If you liked this one, I really think you would like "Hotel on the Corner of Bitter and Sweet" by Jamie Ford. MB - I actually decided to read this one because I did read (and enjoyed!) Hotel on the Corner of Bitter and Sweet. (Just like I liked Guernsey.) This one had a similar ring to me. And *I* would like someone else to screen them on MY behalf. =D Unfortunately, I don't like most modern novels enough as a general rule to make me want to give them any of my even-more-valuable-today-than-last-year reading time. Hence you won't see me reviewing very many around these parts. They have to show promise! Most don't. That said, I do have three others on my bookshelf right now that I thought were interesting and accepted for review. Again with the time thing though. I already almost regret them because I know for a fact that there are far worthier books for me to give my attention to. I finally made it over here! I'm not sure what was happening. In case you didn't see my Facebook comment, I kept getting redirected to another site. I've saw this one around and have been curious about it. I think I will pass by on it, though. I've heard great things about Hotel on the Corner of Bitter and Sweet. I'm thinking I may pick it up eventually.